The proposed highrises look appropriate to the site, and blend nicely with the old brick buildings. Notice that their requested rezoning ups residential window coverage to exteriors substantially. The buildings look similar to the fantastic reno of the Aaron's building in Buckhead, and give off a newish industrial vibe. And please tell where that beautiful jewel box of a building is? JM, that's the new Apple Store at Avalon in Alpharetta. Isn't it cool? It's a modern compliment to the brick structure. Rather serving the same role as the Louvre Pyramid. I like it. Oh, wow! That is just gorgeous. I'm legitimately jealous that Alpharetta has a much nicer Apple store than the city; I hope Ponce can fix that for us. That would be ideal in the courtyard area, but I picture a larger more iconic store. 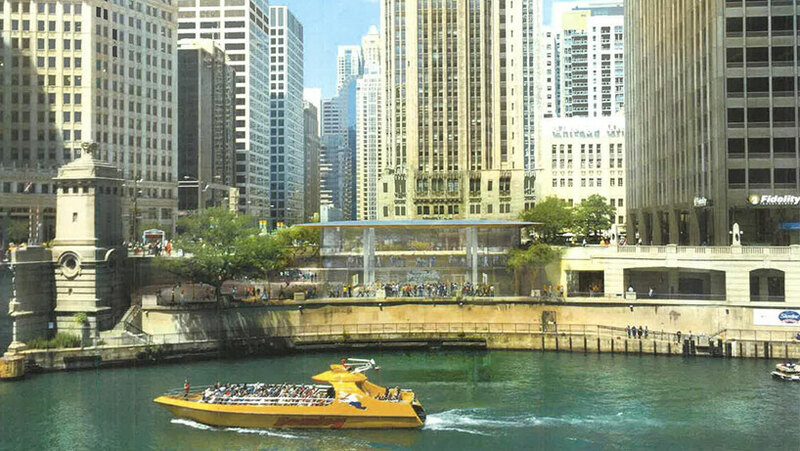 The new Apple on the Chicago River would fit well. Ponce City Market has officially jumped the shark! Positioned beside PCM’s existing (and free) bike valet, the new hourly amenity will be available to hounds of all sizes, from Chihuahuas to Great Danes. Pets can be washed and dried in less than an hour while owners gobble avocado toast inside. This seems silly, but I also wonder if it will be able to serve the vast number of employees that work here. I'm pretty sure Barking Hound Village (the folks running the valet) have a full size location across the street. Maybe employees can drop off their dog on their way up to the office? Seems like that would be a valuable service to offer. However posh this may seem, its going to generate a lot of PR for PCM. I can totally see this being the lighthearted story of the day for local news stations to try to wash the nasty taste of murders and the reports off all things terrible at the end of the hour. We're gonna get mad because PCM leased space to a dog day care and groomer? During the French Revolution they guillotined people for less. I've never understood the obsession with Apple stored. They're cool, and I like them in my neighborhood because of that cool factor, but how often can you go to one? How many times can you buy a phone in a year? I have every Apple product and I still go less than once a year, what am I missing?